The FL-500-RI proximity switches generate electrical signals at your predetermined flow rates, adding versatility and performance to the FL-500 Series flowmeters. Each switch kit contains all the necessary hardware for quick and trouble-free mounting. 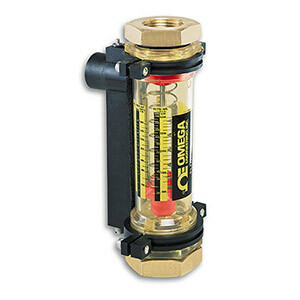 Kits consist of a ring-shaped ceramic magnet that fits around the float in the flowmeter and a proximity switch mounted in a rugged housing that easily clamps to the body of the flowmeter. As the changing flow causes the float to move within the tube, the magnet moves with it, and its magnetic field trips the proximity switch at the predetermined flow rate. Adjustment screw allows for easy flow rate adjustment. Add two switches to indicate both high and low flow rate limits. 참고: Switch activates over a 25% of full scale band; above and below this band, the relay deactivates. Comes complete with one magnet, one switch housing, one foam gasket, two half-collars, four cap screws with lock washers, two nuts, and operator's manual. Two nuts are needed only when two switches are mounted on one flowmeter.